Oil from damaged ships streams through battleship row in Pearl Harbor. Battleship Row was the name for the moorings on the East side of Ford Island where the battleships were moored. 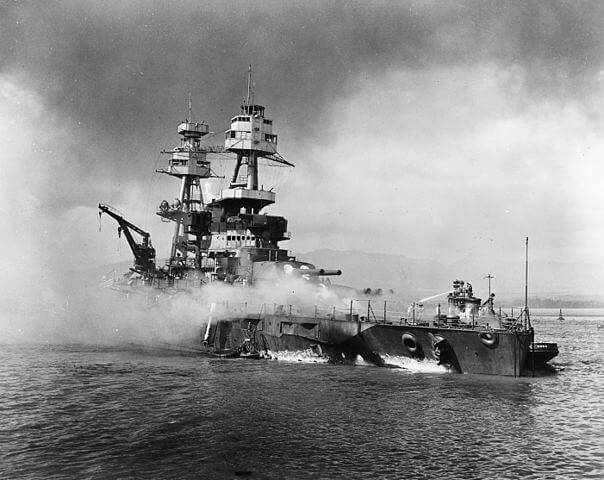 On December 7th, 1941, only 7 of the 9 Pacific Fleet battleships were at Battleship Row. The USS Pennsylvania was in drydock and the USS Colorado was in overhaul in Bremerton, WA. On Battleship Row from lower left to right: USS Nevada, USS Arizona inboard of USS Vestal, USS Tennessee inboard of USS West Virginia; USS Maryland inboard of USS Oklahoma; USS Neosho and USS California. 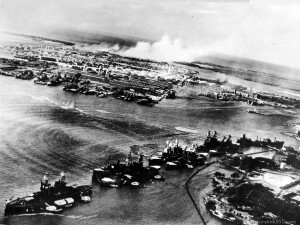 Battleship Row was the primary target of the Japanese attack. Their primary target was actually the carriers, but because the US carriers were not in Pearl Harbor during the attack, the battleships became the primary target. Specifically, the Japaneses had calculated that they needed to incapacitate at least 4 of the battleships. That is why Battleship Row suffered the greatest damage on the “Day of Infamy”. Is there a Battleship Row anymore? Firstly, there are no battleships in service anymore. Even before World War Two, it was becoming clear that battleships would make way for Aircraft carriers. No there is no longer a Battleship Row. Currently at the location of Battleship Row are the USS Arizona Memorial, the Battleship Missouri Memorial and the USS Vestal Memorial.